A status statement for the mainstream specialist. Superior performance. Studded design secures mat from moving while protecting carpet from caster wear, spills and heavy traffic. Medium weight chairman for frequent use on carpets. Smooth beveled edge for easy carpet to mat transition with any office chair. Free and clear non-phthalate, non-cadmium formula promotes a healthy work environment while offering exceptional clarity and durability. The chair mat will ship rolled up in a box, as pictured in the image. To flatten out the chair mat, please follow the following instructions: add weight to the corners of the chairman. The chairman will gradually flatten over several hours. The warmer the chairman, the quicker it will lay flat. Try placing it in a warm room or near a sunny window for best and quickest results. If you have any questions about this product by Deflecto, contact us by completing and submitting the form below. If you are looking for a specif part number, please include it with your message. 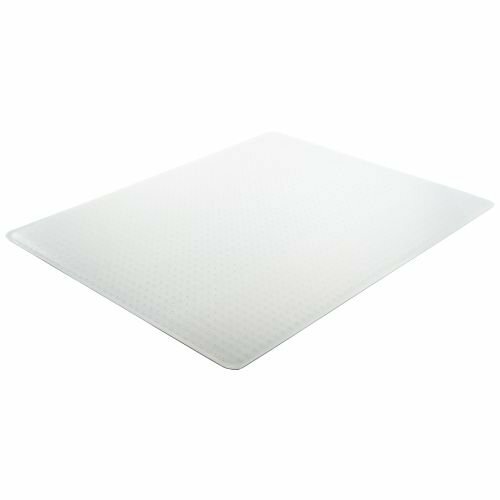 Chair Mats 48" x 72" without Lip for Carpeted Floors - Standard Thickness 1/7"
ES Robbinsamp;reg; - 46x60 Rectangle Chair Mat, Professional Series AnchorBar for Carpet up to 3/4amp;quot; - Sold As 1 Each - Protects medium pile carpets up to 3/4amp;quot; thick including padding.